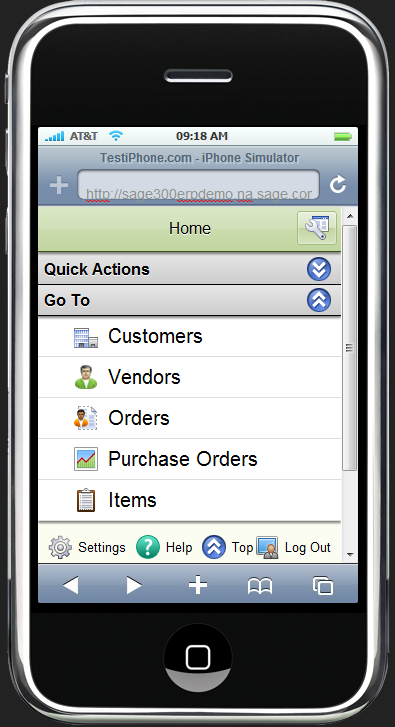 Note: that to run this application on your own system, you need at least the Sage 300 ERP 2012 beta. Generally you would put these as folders under the c:\inetpub\wwwroot folder. Then you can start the app via: http://localhost/sage300/index-dev.html. (Or substitute your own hostname as needed). In the Sage300 application there is a runtime folder. 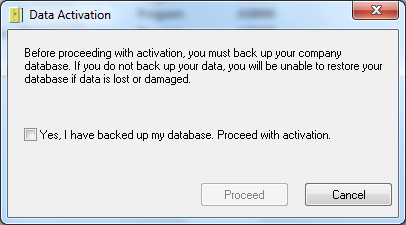 This needs to be copied to: C:\Program Files (x86)\Common Files\Sage\Sage 300 ERP\Tomcat\portal\sageERP\runtime. These are the definition files for the SData feeds that this sample uses. After you copy this, you need to restart the “Sage 300 ERP Tomcat” service for them to get read. As a result, you have to configure the IIS (or whatever web server you use for the static content) to grant access to the SData server. You still have to do this, even if they are the same, since all SData requests from the Argos SDK are CORS validated. The Wiki attached to the Argos SDK on the main Github site above has complete information on this. Like I said, don’t just specify “*” like I have for a real situation, but if you are on different networks with a laptop, sometimes this is just easier. Similarly in a real environment, you would want to use https rather than http. The key parts are the virtualDirectory to form the correct SData URLs for Sage 300. Remember that Sage 300 URLs start SDataServlet/sdata rather than just sdata. This is to avoid conflict when we are installed on the same server as Sage CRM. So notice the url: tag doesn’t include SDataServlet and then the virtualDirectory tag does. This will then cause the correct URLs to be formed. If you are having trouble with URLs then the Fiddler tool is great for debugging what is going on. Note that to work, at least you need to change localhost to the server name you are using. Localhost will only work when running on the same computer. Unzip the two zip files under the c:\inetpub\wwwroot folder. Add something to c:\inetpub\wwwroot\web.config for CORS. Copy the sage300\runtime folder to …\portal\sageerp\runtime. Edit the development.js file if you need to change the hostname. Hopefully this will get you going fairly quickly. This blog post is already getting a bit long, so I’ll go into more detail on how this sample program works in a future post. However this should be enough to get you started with the Argos SDK Wiki information and a working sample. One of the goals of SData is to enable the use of common tools across all Sage products. The Argos SDK is an example of this; it is a mobile SDK library for creating mobile applications that use SData to communicate with on-premise Sage applications. Over time you will see more and more of these sort of tools that leverage SData to provide enhanced functionality for a whole range of Sage applications. 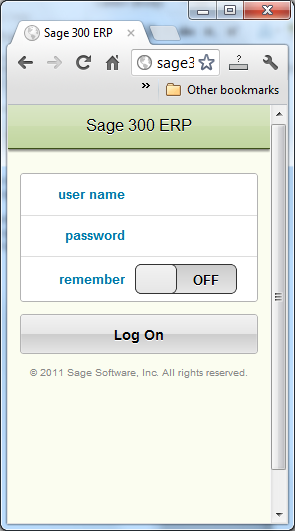 Our Sage 300 ERP 2012 release is now in beta. I thought I’d put together a blog post that summarizes and lists all the other blog posts I’ve written for this release along with a few updates on things that made it into the release since these were written. When we release Sage 300 ERP, it isn’t just the core ERP modules, it also includes many other Sage integrated products, many of which we are now supporting new versions as well. Plus Sage 300 ERP acts as a platform for many third party modules that extend Sage 300 ERP into many vertical industries. All in all quite a large and varied set of new features and services. Roadmap diagrams are always dangerous to put in a blog posting, since once posted, this will be on the Internet for a long time. And as always things are continuously subject to change. At this point the 2012 release is looking good, we were code complete back in June, we are now in beta and our regression testing is going well. Just a few updates since all the previous blog posts. The hope of this is that it gets more attention and that more people will back up their data before performing activation. Generally we look at the leading reasons for calls to tech support and see if we can alleviate them in the program by making things clearer, easier or better documented. I blogged on the new functionality in payment processing (credit card processing) earlier in the development process. At that point the team working on it was feature complete on what they had promised for the release. However since then, they have taken the time to incorporate User Centered Design advice into the feature to make it much easier to use. As a result the screens look quite different from my original blog posting. 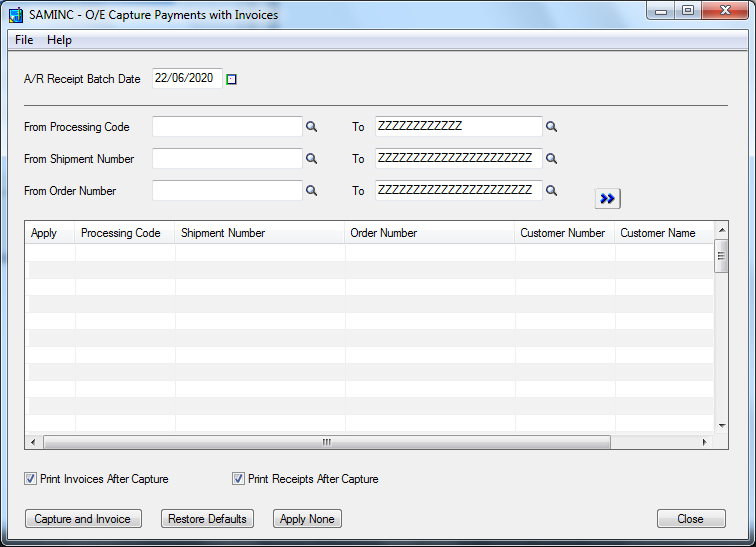 For instance below is the updated screen for capturing batches of pre-authorized payments. In a similar way the team has made quite a few tweaks throughout the various screens related to credit card processing to either reduce the number of screens, or provide ways to fill them in easier (like providing a way to default addresses), or generally making the labels much clearer. 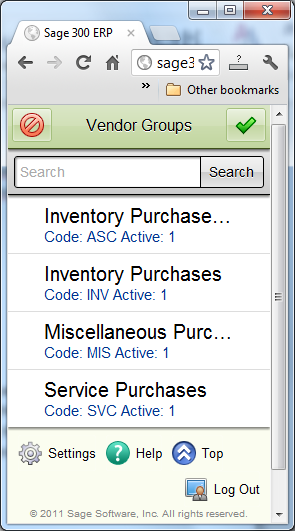 Hopefully all these usability changes will make our Sage Exchange integration a much more enjoyable feature. By the same token, the Sage Advisor Update screen has gone through several usability revisions and looks much better now. Since this feature is all about update, the first thing that will probably be updated on your system is this component, since it likes to update itself. For Lanpak usage, we no longer use multiple lanpaks if you login to multiple companies on the same workstation. However we will continue to use multiple lanpaks if you login using multiple Sage 300 users. This should help with the TCO for companies that divide their accounting across multiple Sage 300 company databases. With every release we want to improve the quality of Sage 300 ERP. With this release we have cataloged all known defects at the start of the release and a release certification requirement is that the number of total defects must be lower at release by 15%. So from release to release the number of open defects is reducing. There is also a lot of work going on so we prioritize these defects so that the ones that affect customers the most (based on severity and frequency) will be fixed first. We want to ensure this isn’t a numbers game where we just fix lots of issues about under-lining or field widths in reports. The real aim to ensure we have real measurable metrics that are published in a dashboard that is visible to everyone in Sage up to the CEO, to ensure we are improving quality in a real and measurable way. At this point our quality debt reduction stands at 45%; hopefully, this will improve a bit further by release. 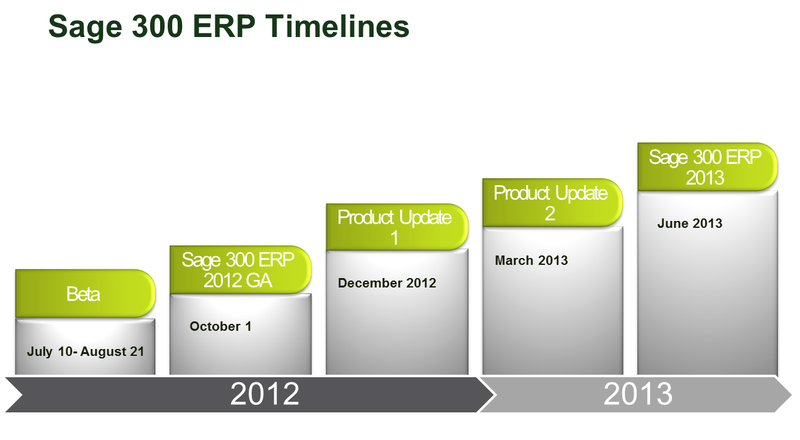 We have a lot of new functionality in the Sage 300 ERP 2012 release. Please check out the beta, if you are qualified. This release leverages shared components from other Sage groups such as the Visual Process Flow tool from the Sage ERP X3 group, the Sage Advisor Update from Sage UK and Sage Advisor PEP from the Sage 50 US team in Atlanta. There are improvements to the platform with enhanced SData support, paving the way for future development. There are many application features. There is updated platform support and updated support for newer versions of other integrated Sage products. 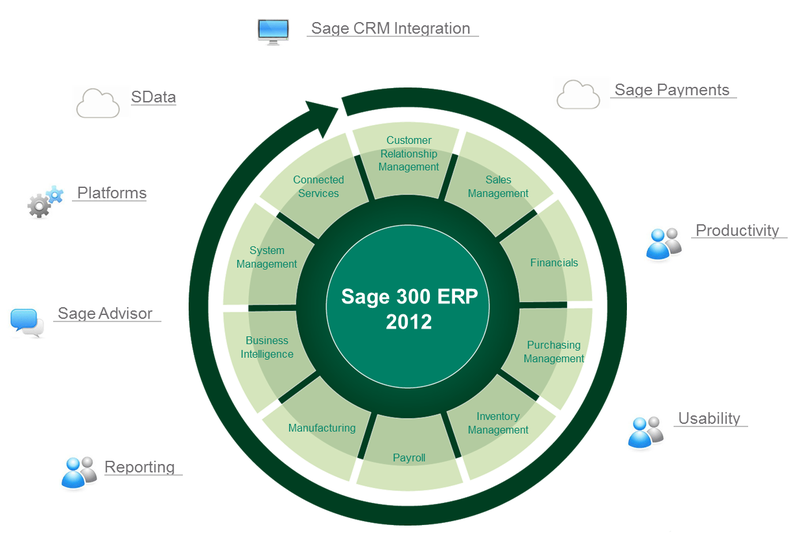 The Sage 300 ERP development group is very excited about this release, and hope everyone has a great experience with it.